Since you’ve probably blushed, sweated, scratched your head or shed tears in the past when learning the basics of speaking Spanish, you may be a little wary of learning how to write in the language. Writing in Spanish can be fun—and, believe it or not, a little bit of daily writing practice can dramatically push your learning progress forward. Actually, contrary to what you may think, most people find learning how to write in Spanish to be a relief. Compared to other languages, it isn’t extremely different from writing in English, and many parts of it are significantly easier to get the hang of. 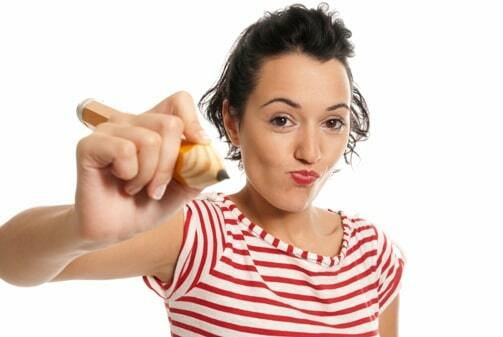 Here are seven points to get you moving fast on the right track to writing Spanish in no time! If English is your first language, you’re lucky when it comes to spelling because learning how to spell in English is quite an enigma. Why don’t “cough,” “through” and “dough” rhyme? Why do you have so many double letters and why do vowels make so many different sounds?! Luckily, spelling in Spanish is much more intuitive than it is in English. This may sound almost too good to be true, but written words in Spanish are actually designed to reflect what they sound like! There are far fewer cases of silent letters, double letters or different spellings for the same sounds. Also, vowels each have their own specific sounds that don’t change, no matter what other letters surround it. Whether you’re a complete beginner or not, there are countless websites to help you with your Spanish learning. Rocket Languages provides a good start to getting the hang of how to spell in Spanish. With both reading and audio aids, you can refresh yourself on the sounds of the alphabet and the way the letters work together by learning some simple words. After you learn a few words, you’ll realize that spelling in Spanish feels much less ambiguous and second guessing about how to spell something is hardly a thing. The only drawback is spelling bees aren’t as fun. While in English, you can’t say one word out of place in a sentence without someone noticing and perhaps even calling you Yoda. Even if it’s considered proper grammar, you have to admit that English has a rather strict syntax for what considered normal in modern English. Spanish is a much friendlier language in this way. In sentences there are usually at least two or three orders that are considered acceptable. Things that stress us out in English are made a lot simpler in Spanish when it comes to grammar. Word order, punctuation and capitalization are much easier to get the hang of. But of course, there’s still much to learn and some additional topics that you don’t have in English, such as gender. Verb tenses, irregularities and mood are a good plenty to learn. With the right sources and a little help, it won’t be hard to get yourself going. There are many approaches to learning the foundations of Spanish grammar. Picking up or checking out a textbook is one of the cheapest, easiest and most efficient ways of getting started. Yet another relief in Spanish is capitalization. Capitalizing words in English can be both excessive and confusing at times. You constantly have to discriminate against whether things are proper or not to decide if they’re worthy enough for a capital letter! Capitalizing in Spanish is a much simpler task. For starters, here are a few things that aren’t capitalized in Spanish as they are in English: Days of the week, months, religions, languages and nationalities. These are all kept lowercase. In other cases, only a little bit of capitalization is used, such as with titles. To write out a title of a movie or book, only the first word of the title is capitalized while every proceeding word is left lowercase. Another case when only some capitalization is used is when referring to a proper noun. Only the specific name is capitalized, while the rest of the title is left lowercase. For example, Mount Everest would be montaña Everest in Spanish. Accents are completely absent when writing in English, but they’re necessary in Spanish. Leaving out an accent usually results in mispronunciation and in some cases, changing the meaning of a word. Let’s look at a quick example. The Spanish word papa is one that’s changed with an accent. 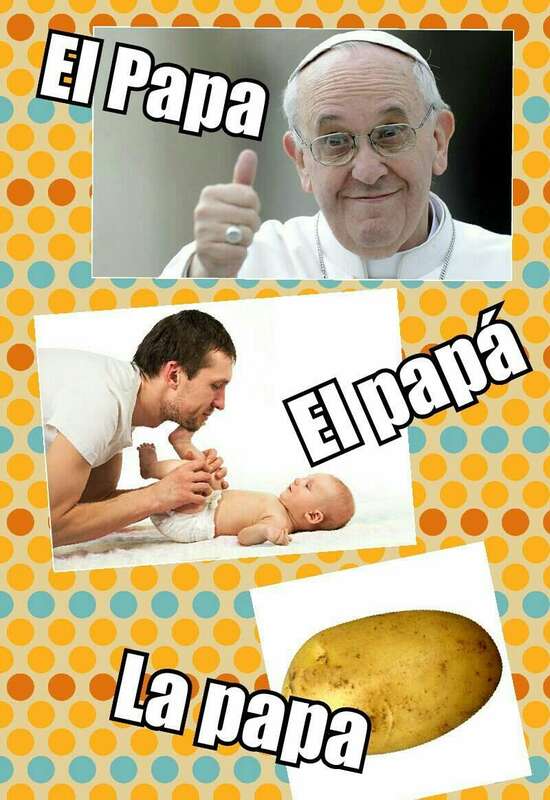 While papá means “father” or “pope,” papa means potato. Though, imaginably, it would be hard to confuse the pope with a potato in context, the accent is what distinguishes the two words from each other. Accents are commonly confused or forgotten with question words: cuándo (when), qúe (what), cómo (how), cúal (which), cuánto (how many). The accents are necessary above these words because the words can be used in two different ways: interrogatively and declaratively. When using the words interrogatively the accents are necessary, but when using the words declaratively no accent is placed. Accents aren’t the hardest things to get used to. Once you’ve learned the rules of when an accent is needed and how to pronounce the words properly, knowing where to put the accents will be a piece of cake. And don’t be scared when you see the rest of the symbols that come up. The only ones we use in Spanish are the accent marks above vowels, the tilde mark above the n and very rarely the dieresis, which we’ll cover shortly. While it’s not too severe, there’s a bit of difference between the way we punctuate our sentences in English and in Spanish. It’s as simple as that. The hardest part of this is remembering how to make it on your keyboard. There are a few different ways to make this symbol on a keyboard, depending on what kind of device you’re using. There are some websites, such as F Symbols, that explain how to make each different symbol from every type of keyboard. While in English you use your beloved apostrophe for many things, such as to form contractions and to show possession, it’s actually not used in Spanish. As for contractions, there are only two in the language, al and del. Al is the combination of a + el and del is the combination of de + el. As for possessive proper nouns in Spanish, the process is kept simpler than using an apostrophe. To say “Jessica’s jacket,” you would say “la chaqueta de Jessica” instead. Now after saying goodbye to the apostrophe, it’s time to say hello to a few new symbols. The dieresis is a symbol that isn’t used in English, but which is used on rare occasions in Spanish. It’s used in a few relatively words throughout the language. One you may have heard before is güero (white-complected person) or pingüino (penguin). The function of the dieresis is to make the g softer so it’s pronounced more like “wer-o” than like other Spanish words you may know that start with gu, like guerra. And of course, if you know the Spanish alphabet, you’re familiar with the tilde symbol placed above the n to create the ñ. Much to our relief, that’s about the extent of symbols in modern-day Spanish. When it comes to spelling and symbols, Spanish can be pretty simple. It turns out that becoming fluent in a language is more than just learning the words. When it comes to numbers in Spanish, there are a few differences between the way they’re used abroad versus in the United States. This goes a bit deeper than just a Spanish versus English issue. The way dates are written is different in most countries other than the United States, including Spanish-speaking countries. While you put the month first, followed by the day and then the year, in Spanish the order of the month and the day are reversed. For example, December 4th, 2015 can be written as 12-4-2015 in English. In Spanish, it’s written 4-12-2015. Writing out numbers which require commas or decimals is also different—backwards to English-speaking Americans. The roles of the comma and decimal are reversed. For a quick example, you’ll use the numbers ten thousand and one-tenth. In English, ten thousand would be written 10,000.10 while in Spanish it would be written 10.000,10. While some parts of the language may be a lot to learn, writing in Spanish is actually not that hard. Enjoy it. It’s a break you deserve. With these points in mind, keep it going and try to incorporate a little Spanish reading and writing into your everyday life. It’s as easy as turning on the Spanish subtitles on your television set or grabbing a Spanish magazine. Keep up your studying and ¡buena suerte!